Christmas Memories in My Heart is a place for me to share all things related to Christmas, which is my favorite time of the year. I plan and prepare for the holidays all year, so that I can enjoy that busy time without having to stress about shopping and all the details of the season. I am actually able to decorate and then enjoy the spirit of the holidays and celebrate Jesus' birth and the reason for the season. You can find links to my three favorite holiday sites in my sidebar. They are Organized Christmas, Our Home for the Holidays, and Magical Holiday Home. All three of these special places are like my home away from home. I have cyber friends there who I feel a great bond with and we share a common love of Christmas. We understand each other and support each other in our quest to have magical, wonderful holidays. Please come back to visit often. 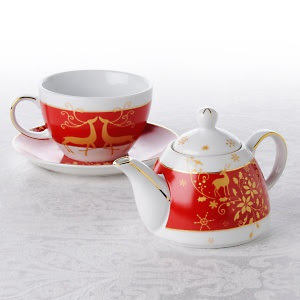 I logged onto HSN on Wednesday when they were having their Christmas in July sale and bought the cutest little teapot and cup for one. It says On the First Day of Christmas! I will gladly use this on what I refer to as the first official day of Christmas---Black Friday or the day after Thanksgiving. This will be a new tradition for me. 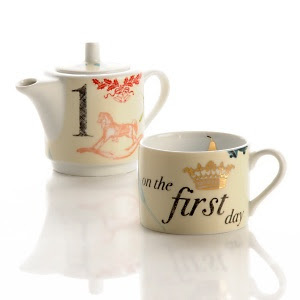 Then I will enjoy my little special pot of tea again on the real First Day of Christmas, which is Dec. 26. It will be even more special to start this tradition on that day of reflection of the holiday season and the countdown of the 12 days to the epiphany. This adorable teapot was only $8! It should be arriving any day. I wish I would have bought a couple more for gifts. I found this other teapot that I LOVE, LOVE, LOVE. It is perfect for Rudy Day as it is bright red and features Rudolph!!!! They also have a matching cake platter, complete tea set for 8 and some dessert plates in the Rudolph pattern. I think they are overpriced, though. I am thinking about treating myself to a teapot though! I can't wait to watch QVC's Christmas in July show this weekend. I usually don't buy anything, but you never know and it is so wonderful to watch all the holiday things on television. A Lil' Christmas Cheer All Year! I love the holidays and decorating for them. I have always been a Christmas nut and have enjoyed the fall and Halloween, but never to an extreme. This year, I decided to host our first Boo Bash, Halloween Cosume Party and have found a new love! I named this blog Haven Haunt as a contridiction of the term haven, which is where the name of where I live. Since it is for Halloween, I decided on Haven Haunt. I have been married for 36 years and have one adult daughter and one son, who is in Heaven. We have a Mini Pin dog, named Duke and a Daushund, who just crossed over the Rainbow Bridge this past summer.